Rakusan did not include the Fan Series in his main sequence numbering. Therefore, the original number used for each of the 36 Series prints has been modified to identify the Fan Series members of its theme. The five different fan silhouette shapes have been here assigned arbitrary numbers 1 through 5. To indicate a fan design these shape designations are added to the 36 Series number separated by a hyphen. In themes which contain duplicated fan shapes, one has been arbitrarily designated A and the other B. 118-4 indicates that this is a Fan Series design with fan shape 4 in the 118 Winter Chrysanthemum and Narcissus theme. Like all other designs in this series, 118-4 was only produced in a single print run, and few copies are currently documented. Apparently, Rakusan had initially intended to have a separate chrysanthemum theme. In the delivery documentation for Fan Series installment four, Rakusan had previewed the contents of the following installment. Theme 113 was originally announced to be 菊, kiku, 'chrysanthemum', but at the last minute Rakusan substituted another theme as 113 in installment five. 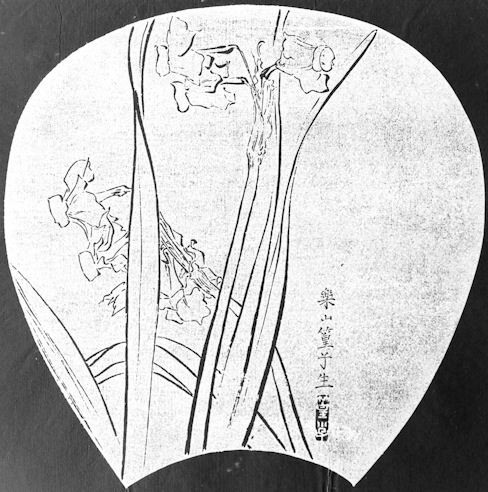 Chrysanthemum designs eventually appeared in this series only as part of a compound theme at 118 in installment six. The resultant 118 Winter Chrysanthemum and Narcissus theme is one of the many entirely regular themes represented by a complete fan quintet and a color woodblock print. The Fan Series designs of the 118 Winter Chrysanthemum and Narcissus theme were printed during September 1934 and were distributed September 15, 1934 as installment six (of twelve). 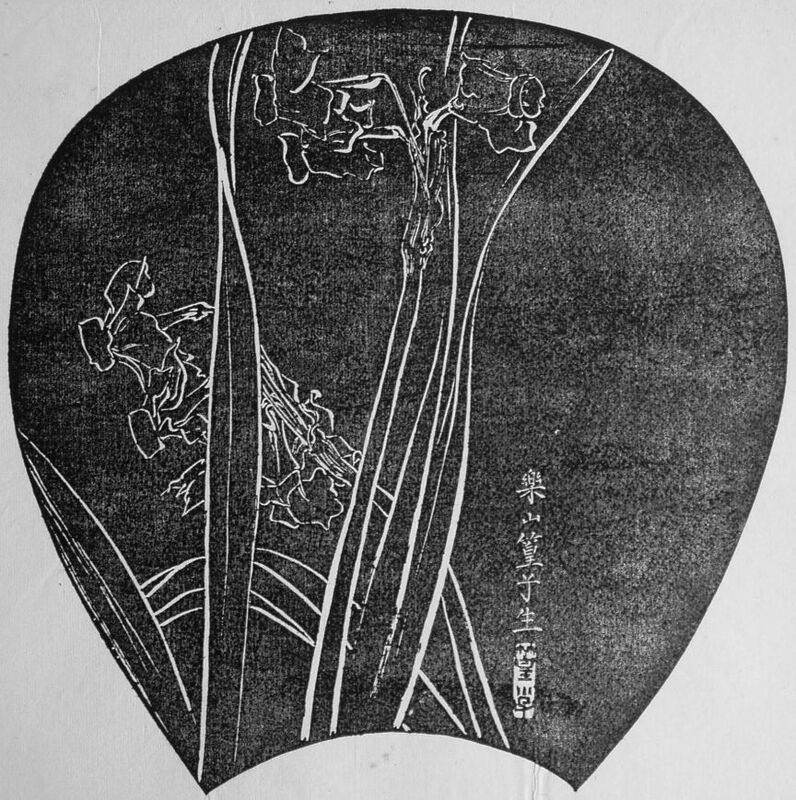 On the delivery documents Rakusan used the theme subject title 寒菊に水仙, kankiku ni suisen, 'winter chrysanthemum and narcissus', which is actually the original title of 36 Series design 118 published at the same time. All of the designs in this theme (including the 36 Series design 118) have seal C which indicates they were carved during the first half of 1934.